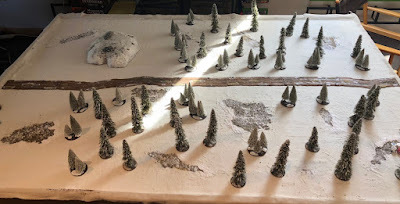 This past Sunday myself and Greg had a CoC game set during the Winter War. 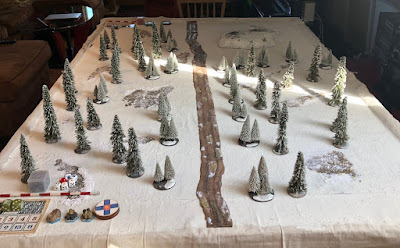 I have been working on a campaign for the Battle of Suomussalmi for a few years but got held up by the inability to find playtesters. Greg likes Early War games, so he is a good choice and he has quite a few games of CoC under his belt. I am about half way through the process now and it is going relatively well. I have been working on this scenario for about a month, it is quite novel as rather than an infantry on infantry battle, it is really more of an armour on infantry encounter. 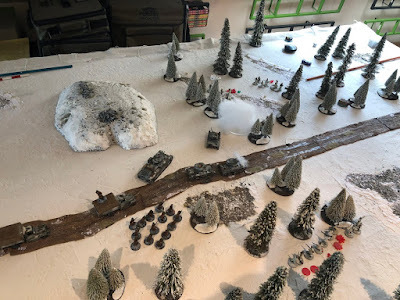 I got the idea from the Skirmish Campaign booklet on the Winter War. The rules need some tweaking but in a relatively minor way and was curious how it would work out. Early January, 1940. The Battle of Soumussalmi is not going well for the Soviets. The 163rd Rifle Division is in retreat, and the 44th Rifle Division which was sent down the Raate Road to support the 163rd is being slowly cut to pieces by the Finns. The Soviet objective of cutting Finland in half is in jeopardy. 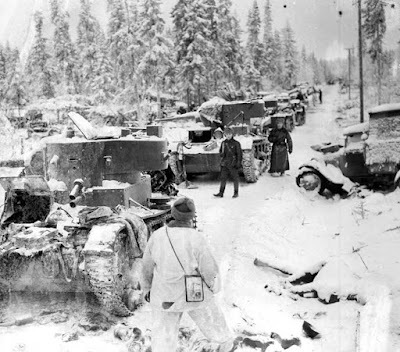 Soviet high command decided to send an Armoured Column to counterattack the Finns and in an attempt to clear the Raate Road. 21 Regular Supports from list. Scenario 4 from rule book: Delaying Action. Both sides play the patrol phase as laid out in the rulebook with the Soviets being the Attacker. The Finns place their JOP's, however the Soviets do not as all their troops enter on the road. Victory to the Soviets if they cause morale failure to the Finns. Basic rule changes: Soviet AFV can be activated on a 2 or a 3, for 1 CI and 2 CI's respectively. The Soviet infantry may disembark from their trucks but the Quad-Maxim team stays mounted. The Soviet T-26 platoon has a SL who may communicate to the other 2 tanks in his platoon as laid out in the rulebook. The T-26 platoon deploys as a complete unit. 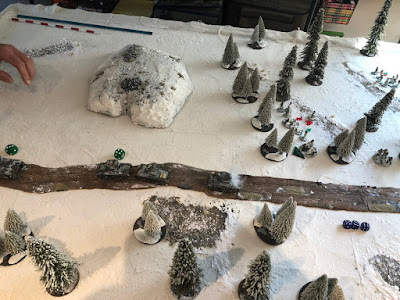 Terrain: Heavy snow, the Soviet trucks have to stay on the road, the Soviet AFV's may go on the verge of the road (3" other side) but risk bogging down. The terrain is rough going for the Soviets but the Finns have skis and are not limited. The Finns may move 2 d6 tactically. The forest is light cover and blocks LOS up to 6". The hill is impassable and blocks LOS. The Winter War Soviet Army list is here, for calculation of the AFV support values I would use the Consolidated Arsenal values as this list is incorrect. The Striking Back Scenario pamphlet is here. Our game started, I played the Finns and Greg played the Soviets. You can see the supports I selected above, as noted the Soviets had a fixed list. I am a very poor AAR writer and I forget to take photos almost immediately once a game starts. I will let the photos tell the story. The Soviet starting point is to the left, There are 2 types of tree stands, the multiple stands demarcate the forest. 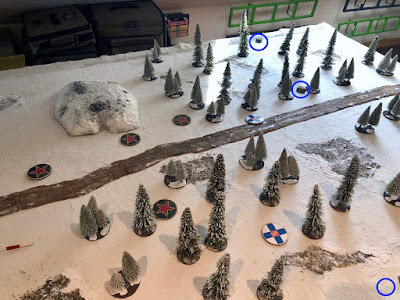 Patrol markers and Finnish JOP's in blue. Greg sends in his T-26 platoon as his advance. I send in 2 infantry squads from my right and left flanks respectively with Molotovs and the squad on the left has the Satchel charges. I cause some shock, but the HE from the 3 T-26's is giving me trouble as well. No advantage to being Elite with HE in the woods. I take out the lead T-26 but as you can see my infantry squad on the Soviet right has been driven back. Greg has now brought on the T-28 as you can see in the far left! On my right flank I have advanced my MMG team little use against the AFV's though. In the far right you can see my AT rifle team getting in position. As you can see the Soviet tanks are venturing on the verge carefully moving 1d6 in order not to risk getting bogged down. I send my MMG team across the road to meet the advancing Soviet squad who has now disembarked from a Gaz truck. I advance another infantry squad on my right but have little AT weaponry on my right flank. As you can see the Soviet Quad Maxim is advancing but I keep my infantry well back. The Soviets are now moving in to attack the Finns. 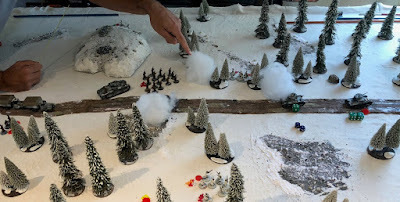 I start to throw smoke pots to block the Soviets tanks LOS, in the foreground you can see that the result of the Soviet infantry advance, the Soviet squad is destroyed after attacking my Finnish squad, but they break as do the supporting MMG team. The game got very heated so of course I forgot to take photos. Unfortunately I lost my AT team to HE as they got left isolated without support. 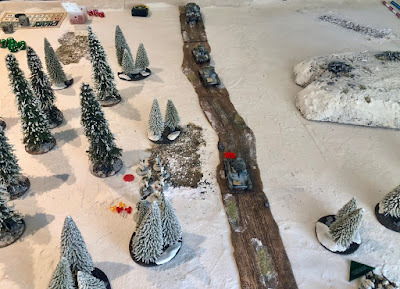 You can not see it but I was able to deploy my 45 mm captured Soviet ATG team in the right foreground (they are just not caught in the photo) to start to take pot shots at the 2 remaining T-26's. 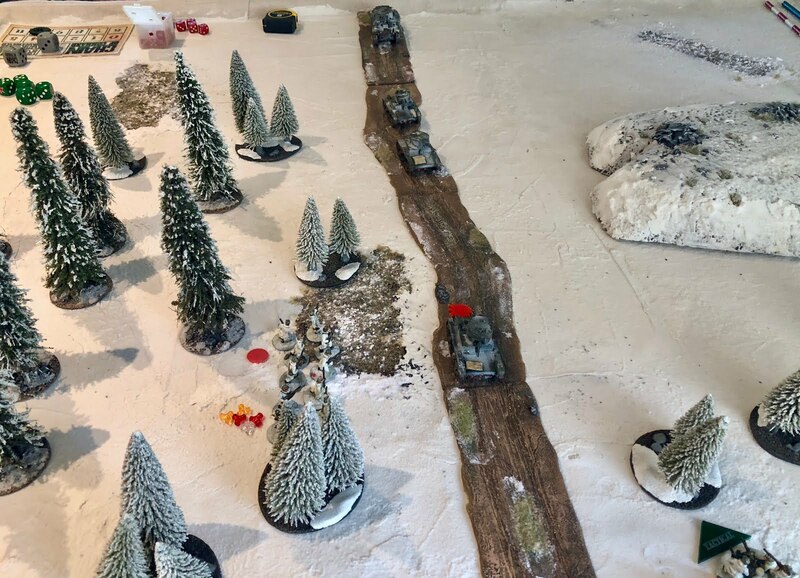 Their aim is accurate but the Soviet armour holds despite a clear advantage in AP. By now both sides have suffered significant morale failure. 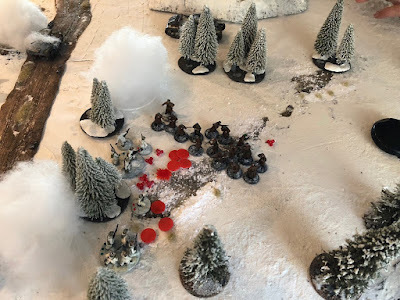 Greg cleverly advances his last infantry squad against a weakened Finnish squad, this was a true Soviet tactic as although outnumbered in Combat Dice by the Finns, the Soviets were not outnumbered in men. The Finns had a SL, JL with squad and an AT rifle team while the Soviets attacked with a SL and a JL with a full squad, they made good use of their grenades before attacking. All my men were slaughtered, 4 morale tests dropped me to zero, while the Soviets dropped to 3. A Soviet victory! We both thought the scenario worked quite well. It could have gone either way. I certainly made some mistakes and really did not effectively utilise my AT resources. Greg did have a lot of double phases near the end of the game and he advanced his forces well. The game played out in 2 1/2 hours despite us having to look up how some of the rarer units worked. Neither of us were really familiar with how AT weapons work, as we seldom play with AFV's. I left a whole infantry squad un-deployed as well as a sniper and never got to try my slide mine. Greg did not have a chance to bring on his 2 BT fast tanks as well as his Flamethrower tank. I believe we both enjoyed the game and Greg mentioned that he would be keen to play again with the Finns! The scenario is set up so you can use what early Soviet tanks you have in your collection as laid out in the Arsenal Summary for the Winter War. Just select 33 points of AFV's as delineated in the above Winter War Soviet list. I will leave debates about which tanks actually fought along the Raate Rd to those more informed than myself. I am still not sure if I would change anything, although I should point out that I did not chose a Roadblock as one of my supports as I had not given the Soviets any resources to remove one. Roadblocks are quite tough to remove in this ruleset. If you chose a Roadblock, I would add a Soviet Engineer Demolition squad with a JL to the Soviet OB. I would then also add 4 more supports to the Finns for a total of 25.